And on the right, one of my 1/600 Xyston ancient vessels, and assorted bits. I am going to take another look at this scale for my Tékumel naval project. One item that I can see already is the size of the 'castle' from Xyston. It seems to be slightly small. A scratch-built replacement might be in order. I finally purchased my copy, and I am looking forward to reading through it again. I saw a demo game at a wargames show- probably Kirriemuir (I think) and the game seemed great fun. 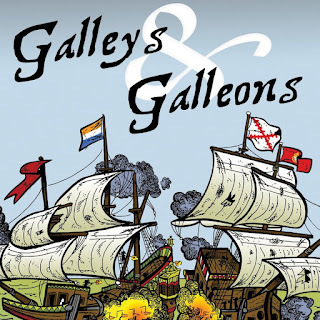 I've really enjoyed Galleys and Galleons. They are a very versatile set of rules, play well, not too complex and great value for money. Thank you, gentlemen. Now I need to get cracking on those ships! You'll be busy! Those 1/1800 ships look nice. Look forward to seeing how they come out with a spot of paint on them. I was thinking the same thing as to Tekumel naval gaming. I am behind you on this project, both as moral support, and chronologically. I am actually thinking 6mm scale, using the Hotz paper ships to start. Les Loups Gris attaquent ! Break out from the camp! Ion Age Muster and other stuff. And now, what do you think? Re-fight: Battle of Coronel 1914 + new sea mat!